Every appellation produces a distinctive bottle of wine, and the appellations in California’s Monterey area prove the point. We really enjoy the taste of wines from this region. They’re a little softer but can still be robust without heavy tannins or high alcohol levels. 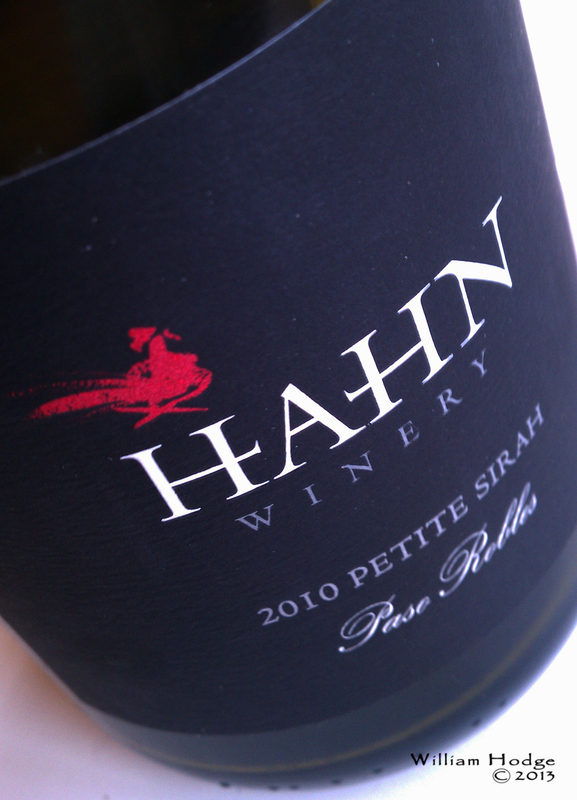 Last night we opened a bottle of 2010 Petite Sirah from Hahn Vineyards & Winery and were reminded of the wonderful wines this region produces. Hahn takes full advantage of their coastal conditions with five vineyards, three in Monterey (Lone Oak, Doctor’s and Smith & Hook) and two in Arroyo Seco (St. Philippe & St. Nicholas.) The appellations allows them to produce wines from Pinot Gris, Chardonnay to Pinot Noir, Syrah, Grenache and of course the Petite Sirah we enjoyed. We have visited twice and tasted much of their wine. Let’s go over the list of our past tastings. 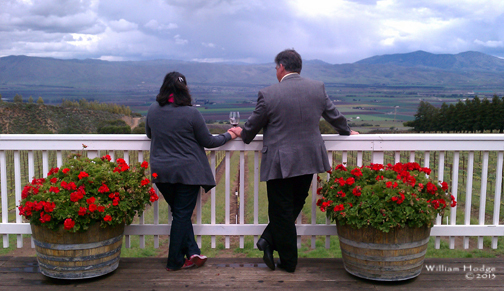 Their tasting room is located atop the Santa Lucia Highlands overlooking the Salinas Valley. On the opposing ridge is the Gabilan Mountain Range where Mount Johnson rises to 3,465 feet above sea level. If you’ve read John Steinbeck‘s ‘East of Eden‘, you’ll recognize his description of the mountain in the first paragraph as, ‘full of sun’, giving the Salinas Valley so much of it’s power to grow California food, and grape. The valley, mountains and rivers of the region were the setting for much of Steinbeck’s writing. It’s a beautiful view and they’ve taken full advantage of the vista with a patio and bar height tables where you can sit and enjoy lunch and maybe a bottle of wine. The winery is still family operated. Nicky and Gaby Hahn purchased the Smith & Hook land in the mid-1970s and produced the first vintage in 1980. They also own Cycles Gladiator Winery in Lodi, a great place for Zinfandel. Their other labels include Bin 36, Copa del Rey, Huntington, Lucienne Vineyards and Smith & Hook. Total Wine and BevMo carry a full line of their wines from Chardonnay to Cabernet, Pinot Noir and Syrah. You’ll find their tasting room at 37700 Foothill Road, Soledad, California, 93960 or more information at HahnWinery.com. Bill Hodge & Erin O’Neill-Hodge enjoy a good bottle of wine, visiting and enjoying California wineries from Lake County to Orange County, from the Paso Robles Gold Coast to Gold Country and from Lodi to Bakersfield. Notes on Our Wine Ranking System – We use a very simple way of ranking wines. We do this with a ✰ system so that no wine maker is ever insulted by our note taking. A ✰ means the wine is good, we have no problem drinking this wine anywhere (specially at a party when the wine might be hosted.) When you see a minus sign before the ✰ we’re not liking it too much. The exciting part is when you see pluses after the ✰. A ✰ + Means you’ve got our attention and we might buy this wine. A ✰ ++ Means we’re hooked and were going to buy this wine. Our codes are listed below. ✰ means -We’ll drink this wine, expecially if it’s hosted! ✰ + means -You’ve got our attention and we might buy this wine. ✰ + + means -We’re hooked and we’re going to buy this wine. This entry was posted in 101 Corridor Through Salinas Valley, Cabernet Sauvignon, California Wineries - New World Wines, Chardonnay, GSM, Monterey AVA - The Salinas Valley, Carmel & Monterey, Monterey Wine Tasting, Pinot, Tasting Room Etiquite, The Pleasures of Tasting Wine, Thoughts About Wine - Exploding Ruby Flowers On Your Palette and tagged bottle, bottle of wine, california, salinas, valley, wine tasting room, wineries.